Our daughter had a great time with the sorting apples activity I set up for her a couple of weeks ago, but it was just a little too easy for her, so I wanted to do an activity that would provide her a little more challenge. This apple themed fine motor apple activity that I set up for her that also works on colors and early math skills. What I loved about this project is how easy it was to change it and make it work for our kindergartner or an older preschooler. All I had to do was change the top of the tree. We recently ordered the Fine Motor Tool Set from Learning Resources and our kids love it! We used the tweezers and the yellow grabbers for this project. Our daughter loved using the yellow grabbers to pick up the pom poms and place them in the toilet paper rolls. 1. Fill plastic bin with red and green pom poms. I used enough to cover the bottom of the container. 2. Cut 2 slits into top of toilet paper rolls on opposites sides near the back. 3. Print 2 tree top templates on green paper. It’s an apple, so you will need to cut off the stem and leaves. Turn apple upside down to form tree tops. 4. For a toddler or preschooler, glue red pom poms on one tree top and green on the other top. For a kindergartner or older preschooler (who recognizes the name of colors), use a black marker and write red on one tree top and green on the other tree top. 5. Insert tree tops into slits on toilet paper paper rolls to form the top of tree. 6. Cut a square from brown carstock that is slightly larger than the toilet paper roll and glue to the bottom of the toilet paper roll to form the base of the tree. 7. Add the toilet paper trees to the apple bin and fine motor tools. 8. Instruct your child to use the tools and match the apples to their tree by putting the apples (pom poms) into the tree (hole in top of toilet paper roll). This post is part of an apple mini unit study that a group of bloggers with kindergartners put together. Be sure to check out the great ideas below. Such a simple yet effective activity with endless possibilities! Love it. How cute! It looks quick to put together but I’m thinking my daughter would play with it for quite awhile. Great idea! Thank Emma! My kids have been playing with it nonstop! Thank you Amy! We just ordered the fine motor set after seeing it on another blogger’s site and love it! Fine motor skills are so important for being ready for Kindergarten! My boys love sensory bins but I have to find a good way to prep and store materials. Thanks for participating in the KBN Kindergarten Blog Hop! Thank you for hosting the blog hop Thaleia! Storage always seems to be an issue for us. We have a shelving unit in the garage we storage all our materials on. If someone told me before kids how much money i would be spending on pom poms, i would have never believed them. We glue them, sort them, do sensory bins with them. There is very little we do not do with them! That’s too funny Eva! We have huge box of pom poms and somehow did not have the color we needed recently for a project. We just did a similar tree activity like this today! What a cute idea with the paper towel rolls! Thanks for linking up on #ToddlerFunFriday! I love all the different things that a child can focus on with this sensory activity. 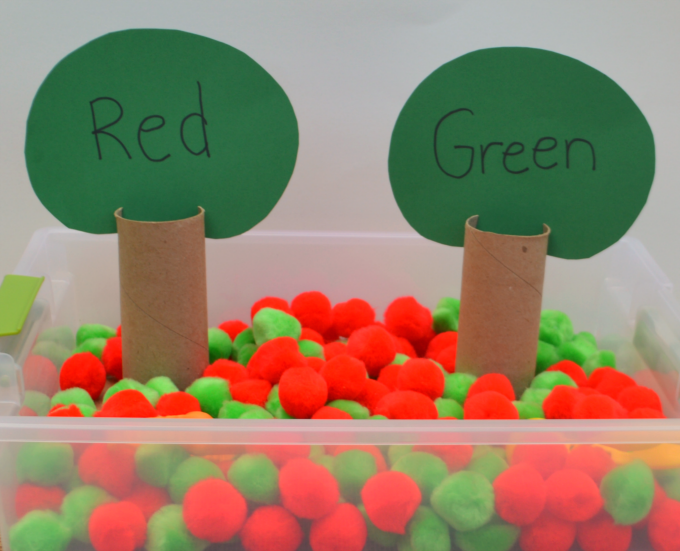 What a fun apple related sensory bin. Thanks for stopping by and sharing with Littles Learning Link Up. So glad to have you joining in. What a simple, fun, inexpensive and fall inspired activity to do with young children! My daughter is almost 2 and I’ve been looking for new ways to practice fine motor skills. She loves hands-on activities and this was one of my favorites when I was searching for new ideas. In fact, I featured it in my recent blog post: https://www.nurturingfamilyandself.com/25-fun-and-easy-fall-crafts-for-toddlers/ because I loved it so much! Thanks for the sharing this great idea!